YAVORIV, Ukraine -- Russia is still sending weapons to separatist rebels battling the Ukrainian government despite a fresh truce in the war-torn east of the country, NATO chief Jens Stoltenberg said Monday. 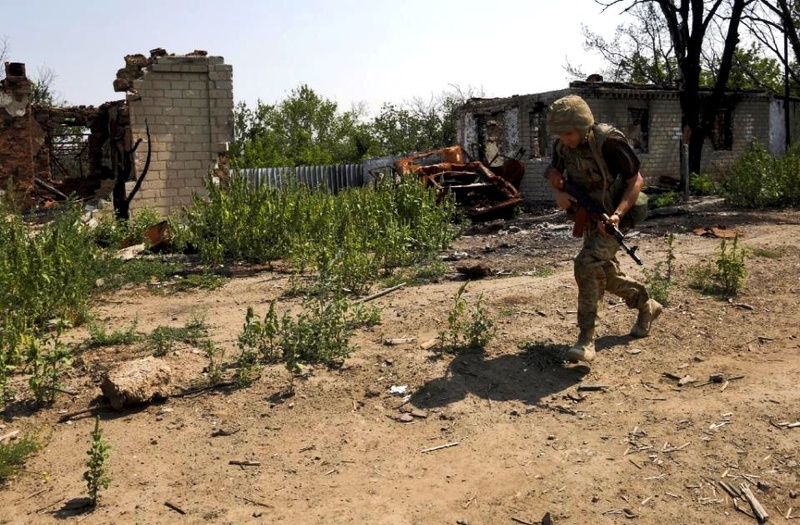 A Ukrainian serviceman runs for cover during clashes with pro-Russian separatists in the village of Luhansk, on August 1, 2015. "The ceasefire is mainly holding. This is, of course, encouraging because that was not the case before," Stoltenberg said on the first day of his visit to Ukraine. "But the situation is very fragile," he said at a joint press conference with Ukrainian President Petro Poroshenko at a military base in western Ukraine. 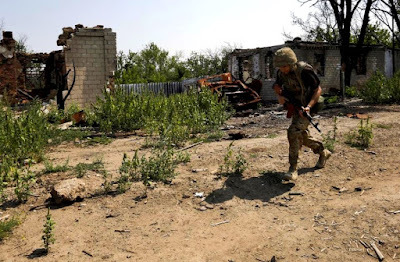 Kiev and the West insist that Moscow has sent troops and arms across the border to fuel a separatist conflict that has claimed almost 8,000 lives since April 2014, allegations Moscow vehemently denies. Ex-Soviet Ukraine says it wants to join the US-led security bloc but NATO has been lukewarm on the proposal. Any move by Ukraine towards NATO membership would stir ire in Moscow, which has accused the organisation of increasingly trying to hem it in following the collapse of the Soviet Union. NATO has ratcheted up its activities in eastern Europe, rotating troops and equipment in its ex-Communist members to ease fears of Russian expansionism. The visit of Stoltenberg is "a part of the policy that NATO has been following for a year and a half," a senior Ukrainian security official told AFP. "They understand very well who is the aggressor and take appropriate measures." The official said he expects the level of violence will remain low ahead of Russian President Vladimir Putin's highly-anticipated speech at the United Nations General Assembly on September 28. Some observers suspect Putin aims to deflect attention from Ukraine onto the conflict in Syria, where Moscow is pushing for an anti-terrorist coalition. "The truce will last at least until Putin's trip to the General Assembly," the official said, speaking on condition of anonymity. Stoltenberg insisted that any attempt by separatists to hold their own unilateral local elections in the territories they control would breach a peace plan signed in February in Belarussian capital Minsk. "They will be fake elections and they will not be recognised by any NATO ally," he told journalists. He was echoed by NATO member Germany which denounced possible separatist polls as a breach of the Minsk peace deal and urged Russia to distance itself from the idea. "It would be a serious breach of the Minsk agreements," Steffen Seibert, Chancellor Angela Merkel's spokesman, said referring to local elections planned by two rebel-held provinces on October 18 and November 1. "And it is regrettable that Russia has not distanced itself from the plans so far." Russia's foreign ministry last week said it "understands" the decision by the rebels to hold the polls and "sees it as a forced step" after truce violations by Kiev. Under the agreements, the separatist regions must conduct local elections by the end of the year "in accordance with Ukrainian legislation and the law of Ukraine". The rebels, however, want to hold local elections under their own terms, which include barring all pro-Ukrainian candidates and holding the polls on days that do not correspond to local elections planned in the rest of Ukraine on October 25.